This is an excerpt from a much more in-depth article Harry wrote regarding noise control, which will be available (along with many others) on our website www.avroomservice.com in the near future. Though the article's target audience was home theater enthusiasts, it certainly applies to any small room environment such as: project studios, conference rooms, class rooms, condo's, etc. You may have heard during some investigative discussions about building a home cinema, that noise control is something not to be overlooked, especially if you’re looking to create a truly awesome home theater experience. But what really is noise control, how much do you need and do all those noise control products out there really make a difference? How do I choose a product and when I do … will it really work? Well, we’re getting to the bottom of all that in this article and while we’re at it you’ll learn a little about what to look for in noise control products, what questions to ask, and what to be cautious of. So without further a due let’s clear the smoke from the room, work our way through the maze of technical jargon, and remove the mirrors so everyone can clearly see and hear what a really great home theater experience is all about. Where to start? What better place than “Why”. Why do we need home theater noise control in the first place? Two reasons: a) noise reduction means improved sound quality, and b) we don’t want to disturb others. The most important reason to design for control noise in the home cinema environment is to create conditions that will first and foremost allow for the recreation of the cinematic experience intended by the artist(s). Pretty obvious right? “Creating conditions” is really what home cinema noise control is all about. If we fail at creating desirable room conditions, the result can quickly go from disappointing to disastrous. The common aphorism “garbage in, garbage out” holds true throughout the structural and electronic design stages of home cinema. Noise is distortions and/or distractions that are not original to the audio signal. One of the most important reasons we approve or disapprove of any listening or home cinema experience is the result of our own ability to listen and experience sound with a critical ear. This includes all of us who enjoy the home cinema experience. The desire to recreate and understand this experience is probably why you’re reading this article. We love it, because we know when the experience is right and like-wise, we know when the experience just isn’t right. We quickly become a discerning audience that knows the difference between awesome and awful, and as a result, become “critical” about our expectations and how we “listen to our surroundings” during the home cinema experience. I emphasize, “listening to our surroundings”, because what we hear within the shell of a home cinema is largely influenced by how the walls, floor, door and ceiling treat the sound energy generated within, around, and through the space. So let’s begin by taking a closer look at how walls, floors, doors and ceilings influence your listening experience. 1. The partition will absorb sound energy. 2. 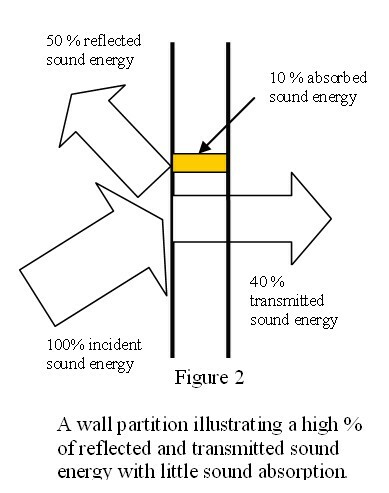 The partition will transmit sound energy through it. 3. The partition will reflect sound energy back into the listening space. 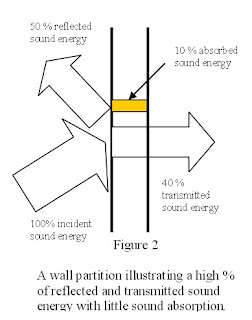 How sound energy reacts with its surrounding room envelope can vary immensely depending on how much sound energy travels via each energy path. Changing or varying the energy path for better or for worse depends on a complex array of products, their material properties, and how they are integrated together to form an assembly. 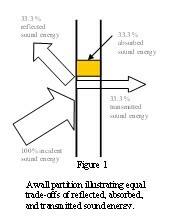 To better illustrate how the flow of sound energy effects the room’s listening environment lets bundle items 1 and 2 (absorption & transmission) together as all the sound energy that potentially “leaves” the room, and item 3 (reflection) as all the sound energy that remains in or is reflected back into the room. Let’s call the sound energy that leaves the room a (alpha) and that sound energy reflected back into the room r (sigma). My high school physics tells me that Newton once said that energy can neither be created nor destroyed. 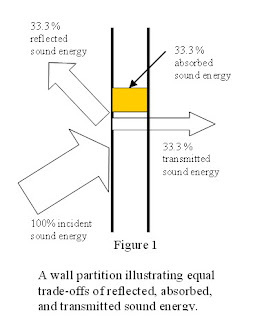 So all the sound energy that is incident to your room’s shell, before any reflection or absorption takes place, is equal to 100% of a partition’s incident sound energy. The following equation describes how these principles come together. 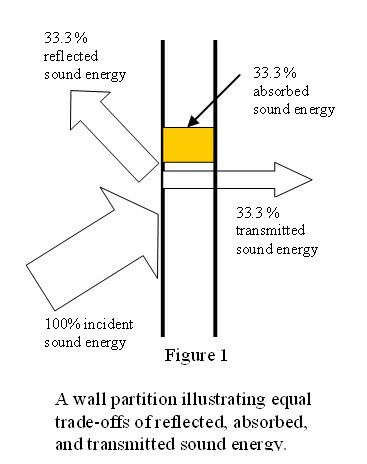 Pictorially let’s look at how different wall partitions can treat sound energy. 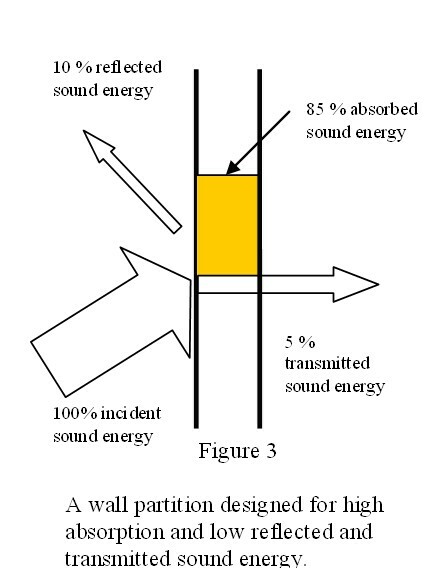 As you can see Figure 3 provides the best results by utilizing a number of sound absorption characteristics to limit the amount of energy flowing back into the listening space as well as into adjacent rooms. Unfortunately, achieving this is easier said than done. Often the use of too much mass and too little panel absorption provides good sound transmission loss results, at the expense of interior room sound quality. i.e. ; way too much energy is being pumped back into the room from the un-optimized partition assembly design. By combining various construction elements and effective products, one can greatly reduce potential design problems or failures. The following is a list of elements often considered to optimize partition absorption, transmission, and reflection. 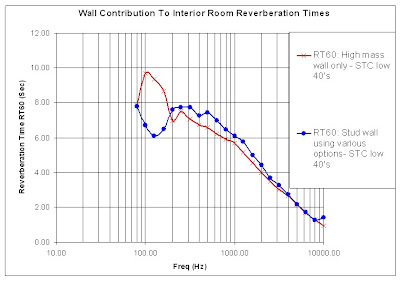 An item I would like to speak about before the close of this article is the potential sound energy that walls, floors, and ceilings can reflect back into the listening room due to poor partition design. As I noted at the beginning of this article, the best assemblies are those that gain the most sound absorption over a broad frequency range using a variety of noise control options & techniques. A frequent problem is relying too much on mass. 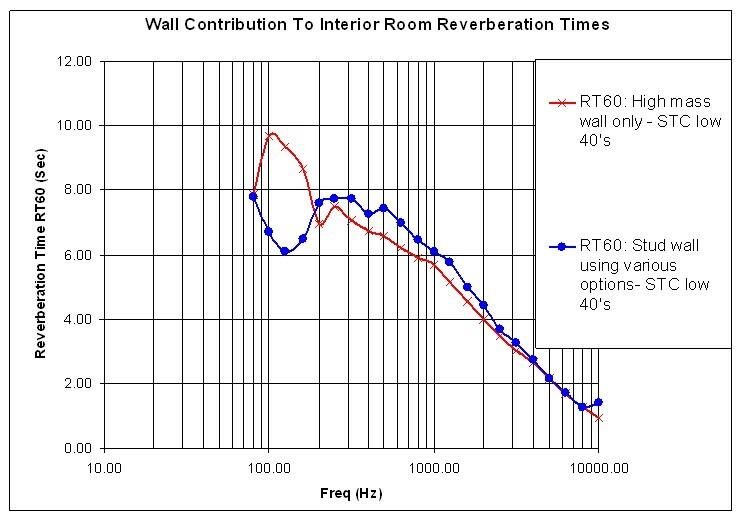 A good example of this are the reverberation times below that show how a wall can push energy back into the room based on its construction. Two walls which both have very similar STC performances, but very different contributions to the reverberation times within the room. One promotes the control of low frequency energy from being reflected back into the room, while the other pumps too much low frequency sound back into the listening environment, which destroys the sound quality. In closing, this is a basic start which I hope you have found valuable toward understanding more about the importance and science of noise control. I’m sure you have many questions: like how many dB will each of the items listed above provide to my home theater design and how many is enough? I hope that future articles will delve deeper into questions like these, as well as addressing the importance of controlling flanking noise, impact insulation, HVAC noise and other design issues. Remember that noise control is a two way street: sound that leaves the space and sound that enters it. 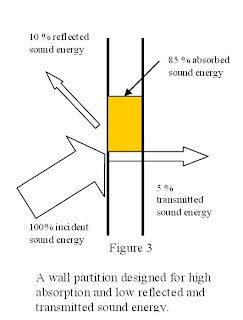 Noise control partitions are system approaches to principals incorporating block, break, isolation and/or absorption of sound waves and vibrations. These systems must adhere to the unique governing weight, thickness, décor, budgetary and/or even “green” requirements of the project. These systems must be designed to address each unique noise control issue; for example, maybe there is going to be a water pump for a pool adjacent to the cinema, or a child’s bedroom above. Different sound energy levels and their frequency ranges must be understood in order for noise mitigation to be designed appropriately. Means of acoustic computer modeling (if new construction) or testing and modeling (if existing) will increase the likelihood of solving problems through proper acoustic design, resulting in a higher performance cinema and a greater experience.